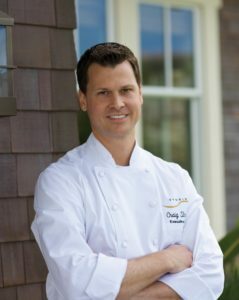 Since 2009, Executive Chef Craig Strong has helmed destination fine dining Studio restaurant with its highly acclaimed modern, French cuisine with California influences. Under his leadership, Studio has achieved a coveted Forbes Five-Star Rating for the last five years and has earned Wine Spectator’s Grand Award, among other industry recognitions. Strong is the force behind the ever-changing à la carte menus, multi-course chef’s tasting menus and private dinners at the elegant Chef’s Table. Growing up in San Diego, Strong was inspired to pursue culinary interests at an early age when he first tried his hand at cooking produce from the family garden. Today he is responsible for Studio’s 1,000-square-foot raised bed garden and uses its bounty in his every day cooking, especially in his innovative gourmet vegetarian tasting menu and for fresh cocktail garnishes used throughout Montage. Previously, Strong served as chef de cuisine at what is now The Langham at Huntington Hotel & Spa in Pasadena, which earned Michelin star recognition for two consecutive years under his helmsmanship. Other past culinary positions include work at seafood-centric, Mediterranean-inspired The Newport Room at the Hotel Arts in Barcelona; The Ritz-Carlton, Buckhead in Atlanta; and he served as sous chef at fine dining Glitretind Restaurant at Stein Erikson Lodge in Deer Valley, Utah. He started his training at 19, attending L’Academie de Cuisine near Washington, D.C., where he studied under respected chefs Françoise and Pascal Dionet.